No Excuses. Just make your Film. Accessible Horizon Films is an Award-winning Collective of 4 filmmakers – Maverick Dass, Stanzin Raghu, Earthling Koushalya & Iyarkayaar Ramesh – who have been making films for about 14 years in the US and India. Their films have won awards and screened at various International Film festivals around the world(Los Angeles, New York, Germany) and broadcast on National TV in India. Their first critically-acclaimed Tamil Feature film, ‘Ayynoorum Ayynthum’(500 & 5) was Officially Selected at the Stuttgart Film Festival, Germany and the International Film Festival of Kerala(IFFK) and was released in May 2016. It was produced Independently using the Do-It-Yourself style of filmmaking. They have also made 6 short films and 3 documentary films which have screened at international film festivals and are working on a new film. Their experience involves teaching Visual Communications in the US and conducting & organizing classes and Filmmaking Workshops at the Loyola College, Chennai, Pondicherry University, Puducherry and Independent film clubs for students and aspiring filmmakers. Filmmaking cannot be taught in a day, nor can it be taught in a lifetime. It is one of the few disciplines that requires constant learning/unlearning and hands-on experience. 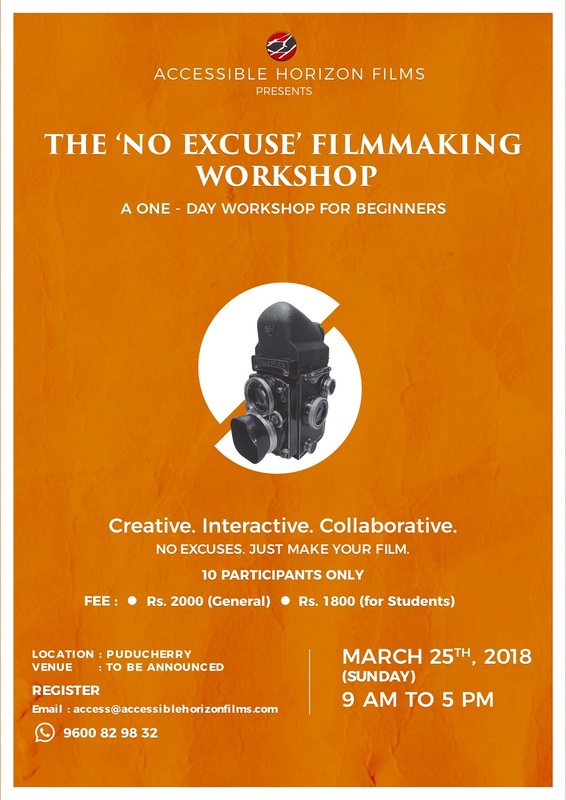 So this workshop(for beginners) is a foundational point for those who have never made a film and/or who want to make a film. Before the advent of low-cost digital technology, filmmaking always had a hype around it. There were so many obstacles or excuses to making a film. Now, one can make a film even with a smartphone and a basic editing tool. But that’s not just it. How do we tell a story, with the tools we have at our disposal? This workshop will address blending the artistic with the technical. So, at the end of the workshop, there will actually be No excuse for anyone who wants to make a film, to not make a film. The workshop will take a holistic, conceptual and hands-on approach to making a film, which will include Pre-production, Production and Post-production stages. Importantly, by the end of the interactive and collaborative session, participants can take away a completed Micro Film/Scene that they have created as a team.